In the U.S. Virgin Islands, there are three islands, one of which is rich with history and solitude for travelers looking to avoid the highly trafficked tourist spots. That would be the island of St. Croix. The eastern most island is the largest of the three-island chain. Recently, my family and I took a week of vacation and stayed on the eastern side of the island at the Villa Madeleine resort. Our two bedroom villa, the “Sea View”, sat high above sea-level and was nestled between two mountain tops. Floating in the pool, we overlooked the most popular snorkeling island in the USVI, Buck Island. We ate dinner by the pool at night and enjoyed our breakfast coffee the same way, watching the opal blue waters of the Caribbean. Villa Madeleine offers unmatched privacy and security in an impeccably furnished and maintained home. This newly purchased and recently redecorated property had its own private pool, wifi access, flat panel televisions with bluray in three rooms, and all new kitchen appliances and dishware. If you wanted to stay in the Villa all week and simply enjoy the pool and the view, you could! Fifteen to twenty minutes away is a full-size grocery store (but there are a few convenience stores along the way) with the best prices in the Virgin Islands (we know, we have been to St.Thomas and St.John). You can stock up for the week and just hunker down to complete privacy, should that be your inclination. Going out to eat, you may never have to go further than the Cheeseburger In Paradise restaurant, ten minutes away on Route 70.
crazy! St.Croix is the largest of the three islands. It’s triangular in shape, offering beaches on all three sides (north, south and west), each with its own respective quality and charm. 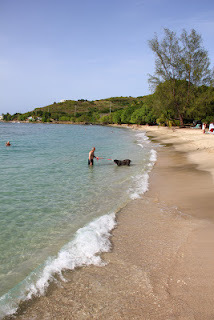 My family enjoyed the north/west beaches the most! 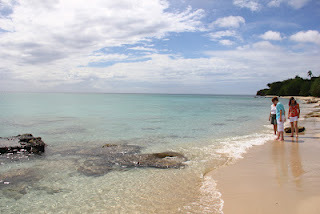 If you want quiet white sands, Rainbow Beach sits waiting on the west coast of the island. 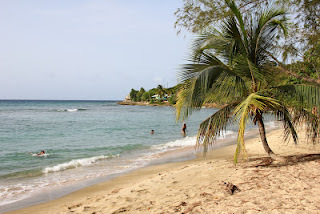 If you like a combination of sand, rocks and snorkeling, Cane Beach on the northern coast might be your pleasure. After a day at the beach, you can stop at the ‘Off the Wall’ beach bar and grill for burgers and pizza, drinks, music, and a gorgeous sunset nearly every night. 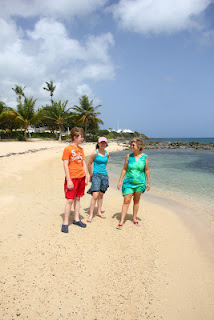 We explored the Fort at Christiansted and took the ferry to the island for Hotel on the Key where we rented Kayaks and explored the inlet at Christiansted. We visited the Cruzan Rum distillery on the west end of the island where 55 islanders made over 9 million gallons of Cruzan Rum last year…there is only one distillery and it’s waiting for you on the island of St.Croix! Cruzan Rum costs almost nothing on the island and you can bring back 6 bottles per adult duty free. If you are looking for a special moment, try this one…get up before sunrise and make yourself a pot of coffee. Take a big cup of java and drive ten minutes (or less) up the road to Point Udall. Point Udall is the eastern-most land of the United States. It’s the first place in the U.S. that the sun is visible. There’s nothing like seeing a sun rise from the ocean. I had an extra bonus, the full moon set over the hill behind me right before the sun rose to announce the dawn. If you like to gamble, right around the corner from Villa Madeleine and just past Point Udall, the Divi Island Resort boasts a public Casino. Since it’s right on the beach, your kids can go enjoy the north shore or mini-golf while you try your luck. Finally, no trip to St. Croix is complete until you take a boat over to Buck Island. It’s one of the premier, if not the best, snorkeling and scuba diving locations in the Caribbean. We chartered with Captain Carl Heinz who sailed us over to the island on a tri-hull catamaran. The five hour charter cost only $65 per adult. 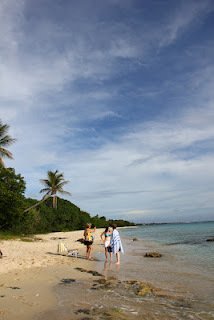 We snorkeled for an hour off of the eastern point of Buck Island at the Coral Reef Wall. The crystal clear water combined with the colors of the reef and fish to give my family a day we will remember for a lifetime. 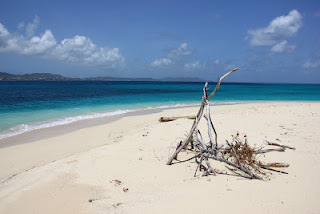 We then sailed around to the front of the island for a couple hours on the white sands of one of the most beautiful beaches we have ever seen. It was the finale of the trip! If this sounds great to you, and why wouldn’t it, you have to try Sea View at Villa Madeleine. Whether you’re into private vacationing, beaches, history, exploration or water sports…you will find everything you’re looking for! !